A glorious morning service out on the big quad. The air is cool at this hour and I relish my tallit wrapped around my shoulders. The davenen is led by two of my ALEPH chevre, both cantorial students, and the singing is wonderful: just the right balance between beloved melodies and classical nusach. I realize, at the end of the service, that I ought to have recorded it so I could sing along with it when I daven at home -- but I didn't think of that in time; it can only be what it was, a beautiful hour of prayer which arose and then disappeared like a sand mandala after a wind. 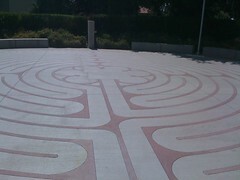 I discover a meditation labyrinth behind one of the buildings where we've been having class. It is painted and carved into the concrete. I put down my backpack and begin to walk. At first I take slow steps as though in a wedding procession. After a while I realize that I have walked and walked and am still nowhere near the center. The path is longer and twistier than I expected. (What else is new.) Soon I am almost running, my sandals slapping the pavement, keeping an eye on the road ahead step by step but not allowing myself to anticipate where I'm pretty sure I'm going. And suddenly I'm at the middle, the jewel in the lotus, the surprise at the heart of the rose. Wednesday turns out to be Miraj -- the Ladder -- when Muslims commemorate the night journey taken by the Prophet (peace be upon him) into seven levels of heaven (where God granted Muhammad the gift of the obligation to pray 50 times a day, and Moshe convinced him to return to God and ask for a reduction -- hee!) After hearing this story we move into a meditation in which we enter the seven levels of the heavens of our hearts, the place of light upon light, where everything is One. After that, reading Zohar texts about the cave of Machpelah, and Bawa texts about the infinite holiness in the deepest level of the human heart, feels like returning to a place where, thanks to our meditation, we've already been. I am sitting with two friends around a small table, outdoors, not far from the dining hall. The sky is blue darkening into grey, but there are no stars yet, which means we can still daven mincha, the afternoon offering. We sing the ashrei with gusto. Another friend walks up and we offer him a place in our davenen, but he's already prayed, so he just keeps us company and offers hearty amens. We sing the weekday amidah, our voices blending and braiding. The sky subtly darkens more. By the time we are done we've attracted a few more friends who join us as we share a drink and talk about the program. When we part, at last, night has fallen. I go to bed with the melodies of prayer in my ears. We follow a winding path into a tiny Eden, a hidden garden filled with birds and blooms. Sitting beneath a wrought-iron bower laced with vines, we each write our own personal storytellers' prayer. And then we take turns telling the stories we've spent the week preparing. I tell my adaptation of Naftali the Storyteller and His Horse Sus (by I. B. Singer) and as I speak and gesture I can feel the story coming to life. My classmates tell stories which give voice to Bathsheba, to Elijah the Prophet, to the animals aboard Noah's ark. Each time someone steps forward to take the stage we are all rapt with attention. At the very end of our class, Devorah Zaslow tells a story about the power of stories, and blesses us that we might take these skills into our lives and become tellers too. In the final session of my afternoon class, we read the amazing tale of the Rabbi and the Sheikh, by Rabbi Yitzhak Farhi (d. 1853) as translated by Zvi Zohar. (There's a synopsis of the story here.) It is a beautiful tale about a rabbi and a sheikh agreeing to trade a mystical secret, fasting and immersing and making teshuvah and then entering into a secret garden and into the holy of holies together. It's extraordinary -- not only because it's a stunning story of spiritual seekers across traditions, but also because it was written not by a 21st-century ecumenist but in the late 1700s or early 1800s by a rabbi in Damascus. And in the story, each seeker had some wisdom the other didn't have. Each one learned something about his own wisdom through the other. True wholeness, and the deepest connection with the Holy, was only possible when the two seekers journeyed together. How good and beautiful it is when brothers and sisters learn together in peace.